Has the growing Google-Facebook duopoly made marketers complacent? Talk to any marketer. Ask them about how they plan to execute their digital advertising strategy. If the first words out of their mouths aren’t “Google and Facebook,” I’d be shocked. a bit of a jump from the firm’s earlier projection of 60.4 percent. In terms of dollars, this means Google will earn about $35 billion in revenue while runner-up Facebook will claim a $17 billion piece of the pie. Chump change, really. 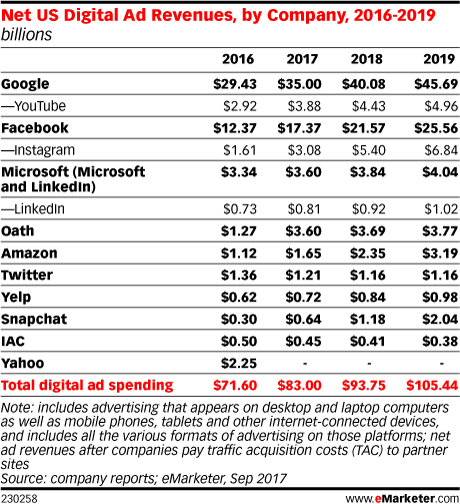 And while a mere three percent increase over estimate may seem like a drop in the bucket – since Google and Facebook own such a big chunk already – there’s a little more to this story: more digital marketing dollars are, almost by default, getting funneled into this behemoth of a duopoly. Let’s think about why. Both media companies are, for better or worse, mass-market darlings. They have successfully carved a (massive) niche for themselves that basically appeals to everyone. And let’s face it, Google more or less owns the territory of search – it earned its crown the minute the company’s namesake became a bonafide verb – and Facebook is widely seen as the social network. Safe to say that neither company has much of an identity problem. Objectively, it would seem logical to say that it makes the most sense to spend more digital marketing dollars on platforms where more consumers go – even more the case if your focus is all about volume (i.e. getting your marketing message in front of more consumers). By all means, go for it. Both platforms give you instant access to billions of consumers. But massive reach alone is really only part of the equation. You actually have to know how to put that massive reach to work for your brand. That comes down to data (big surprise here), but on a couple of fronts. First, both Google and Facebook have done a lot of the heavy lifting to analyze practically every interaction that takes place on their platforms. The end goal: to help brands target the right people with the right message and with the right creative at the right moment when they’re most likely to take action. From optimizing advertising messages to identifying even the most nuanced consumers behaviors – across desktop, mobile, and, you might even say, beyond – and literally everything in between, both platforms are mastering the art of targeting and conversion. The fact that both Google and Facebook can take out a lot of the guesswork when it comes to targeting, reaching, engaging, and converting a massive amount of consumers is the main reason why both platforms continue to get so much investment. The bottom line is: we trust their science. There’s another side of this coin, however – and it relies a lot on how well you understand, with precision, the audiences you want to reach through your digital marketing efforts. To put it bluntly, if you want these platforms to generate some serious results for you, you actually have to know who your customers are: their digital behaviors, what they search for, where they shop, what drives them to action, and beyond. The only way to achieve this is by having a crystal clear picture of who your target customers are. A good place to start is by using your own data, along with other third-party or partner data, to create highly-targeted and brand-relevant audience profiles. With this information in place, the real magic can happen – on Facebook, Google, and across the entire digital marketing ecosystem. It’s no secret that both Google and Facebook have doubled-down on their respective audience targeting efforts to help brands better optimize their own audience insights. From Google’s Similar Audiences and Customer Match advertising products to Facebook’s Lookalike Audiences and recently launched Value-Based Custom Audiences targeting solutions, it’s now possible to take your own CRM data to target and reach potential new customers who look and act a lot like your actual customers. Why this is important? Your current customers are your customers for a reason. Somehow you’ve created a connection with them – through your brand story, marketing messages, products, services, and so on. So, the assumption being made by both Google and Facebook is that consumers with similar demographics, behaviors, and interests to your very own are more likely to convert into new customers. And this is precisely what makes both platforms so attractive to marketers. They provide brands with instant access to billions of consumers that can be sliced and diced into any audience segment imaginable – more importantly, those that are likely to buy. Here’s where the ball gets thrown back into your court. Simply finding these highly-likely-to-convert customers is only half the battle. You’ve got to take everything you’ve learned by wooing your actual customers and turn it into hyper-relevant creative and messaging that will get them over the finish line for your offer. And if you’ve used the tools available by both Google and Facebook successfully, your approach for engaging your target consumers should be anything but one-size-fits-all. I’ve said it before, and I’ll say it again: not all consumers are created equal. The way you engage them through digital marketing shouldn’t be either. If you’ve paid any attention to the customer data available, done the due diligence to create your own audience profiles, and used that information to build highly targeted audiences on both platforms, the only thing left to do is to engage and convert. Unfortunately, this is where I feel things start to go on “autopilot.” I think we’re all so in awe of the infinite scalability of both Google and Facebook that we, as marketers, have started to see them as the de facto platforms for digital advertising success for that reason alone. Their unbalanced share of the market is indicative of this. But let’s face it, scale and reach isn’t marketing; marketing is just as much about finding our target consumers (the science) as it is about engaging them in relevant ways (the art). The predicament I think we’re in right now is that we’ve become too preoccupied with “finding” and surprisingly complacent when it comes to “engaging.” It almost begs the question: has data become a crutch? Let’s face it, data is king – and there are very few marketers out there who would argue otherwise. Data tells us who are customers are. Data informs how we target and find them with utter precision across the digital world. Data also helps validate the effectiveness of our marketing efforts with measurable results. Even so, it doesn’t change the fact that your product, your offer, your message, and your creative strategy all still need to be strong. Winning in the digital advertising game requires winning at every step along the entire customer acquisition process. One weak link is all it takes to unravel an otherwise successful campaign.